Romanticism), comprising of analysis and practice of the various styles of Western music theatre, including expressions of modernity. The course also includes various practical workshops, applied to specific Belcanto techniques and aesthetics: from seventeenth-century “recitar cantando” to expressions of the Apulian and Neapolitan school; from coloratura techniques to variations in early nineteenth-century Italian Belcanto tradition. Specific artistic experience on-site, organised during the Festival della Valle d’Itria, may present the chance for the pupils to enrich their education, thanks to the guidance of great supervisors, prominent interpreters and concert-masters. The course also includes a module specialising in in-depth analysis of Baroque Belcanto, with prestigious master-classes and valuable one-to-one lessons for young performers with a particular interest in, and inclination towards, this kind of repertoire. This specific, personalised course is enriched with opportunities for practical work experiences during the 2016 edition of the Festival. Alongside the higher education courses for operatic performers there will be a course for Assistant Conductors, dedicated to young pianists who will have the opportunity to participate actively to the lessons, rehearsals, and the productions fo the Festival as part of their work experience. The course is aimed to create new Assistant Conductors, also through the achievement of a clear awareness in relation to the needs and technical characteristics of singing, the specificities of opera theatre, with its dramatic and musical values, as well as its professions. The course entails both classroom lessons on theory and technique, and work experience in collaboration with the Festival della Valle d’Itria. The Music Director of the Accademia del Belcanto and of the Festival della Valle d’Itria, Fabio Luisi, will coordinate the activities of internationally renown teachers and artists. 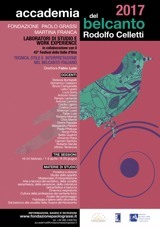 Teachers: Stefania Bonfadelli, Domenico Colaianni, Bruno Campanella, Lella Cuberli, Luca Gorla, Antonio Greco, Renata Lamanda, Antonio Lemmo, Cristina Liuzzi, Sherman Lowe, Fabio Luisi, Roberta Mameli, Chris Merritt, Ettore Papadia, Alessandro Patalini, Paola Pittaluga, Sonia Prina, Sesto Quatrini, Vincenzo Rana, Carmen Santoro, Roberto Servile, Vittorio Terranova. The course for Assistant Conductors is aimed at candidates possessing artistic merit and inclination towards the profession, not to mention a solid technical and theoretical preparation, such as to deserve perfecting and practice on the field, with the aim of professional inclusion into the profession in opera theatre. The courses are free but places are limited, and admission is restriced through a selection. There are three places available for the role of Assistant Conductor. Candidates who have not been selected may take the place of selected students in case of any rejection or drop out. The selection of the candidates will be carried out by the Judging Panel (presided by the Director of the Academy) on the basis of demonstrable qualifications and after a public audition which will be held in Martina Franca at the ‘Fondazione “Paolo Grassi”’ (where the Academy is based), on Saturday the 18th February 2017 at 12 pm. Details of the convocation for the audition will be communicated directly to the candidates. - hold a Conservatoire or Musical Institution diploma, or level I or II academic diploma issued by an official music Institution. Candidates who have studied in foreign institutions will only be considered if their title is commensurate and equivalent with that of the institutions described above. Candidates possessing professional experience as piano accompanist to opera singers will be at an advantage. The Director has the right to admit to the courses pianists who, during ex-tempore competitions or auditions, have shown particular artistic merit. The subject of the e-mail should clearly specify “Iscrizione audizione per Maestri Collaboratori”. The e-mail should also contain details of the repertoire the candidates have chosen to prepare for the audition. 1.	an Aria from the opera “Un giorno di regno, ossia il finto Stanislao” by Giuseppe Verdi. 3.	an aria proceeding from an opera by Antonio Vivaldi or Georg Friedrich Händel. The Committee will also request first-sight music score reading of randomly-selected passages from Italian opera repertoire. The Committee has the right to choose whether to listen to the whole or only part of the programme indicated in the application. Attendance to the classes is mandatory. Times and dates will be established together with the teachers. Candidates who have successfully participated to the whole course will be given a certificate of attendance. Lessons will take place mainly at the ‘Fondazione ‘Paolo Grassi’’ in Martina Franca. Practical work experience will take place, apart from the above-mentioned location, also in the areas dedicated to the Festival della Valle d’Itria. Staff of the ‘Fondazione ‘Paolo Grassi’’ and the Artistic Direction will be happy to help with indications and support with solutions for accommodation at established rates.